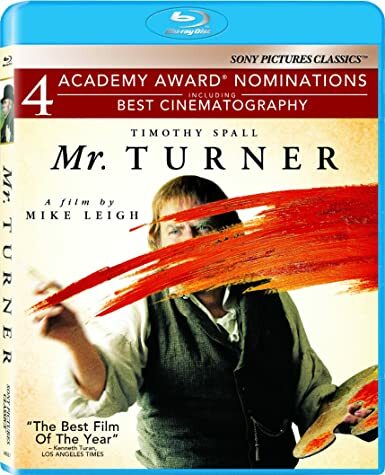 There is a scene in the first half hour of Mike Leigh’s recent film Mr Turner, juxtaposing the creative ambitions of amateurs and professionals. We see Timothy Spall as Turner, greeting a noble on his estate. Another person –likely another artist—hangs back, waiting for the right moment, as Turner and the noble discuss the relative merits of horse and ox pulling a plow or made into dinner. When he sees his moment to jump into the conversation, he wishes him a good evening before asking “are we not blessed… by the heavens… to witness …so glorious… a crepuscular time of day”? Having seized the moment and mangled it so thoroughly, he steps out of the spotlight, as the noble quietly pronounces “imbecile” to Turner, and they enter a large room, to examine the way several of Turner’s paintings are displayed. Throughout the conversation, an amateur (likely a member of the noble household) is playing Beethoven on the piano, apparently just having learnt the slow movement of the Pathetique Sonata, stopping & starting with mistakes and changes of pace. Turner approaches this handsome woman and in due course, when they discover a mutual appreciation for Purcell, she plays Dido’s Lament. Turner attempts to sing the tune as only ardent fans nowadays sing Turner Swift or Lady Gaga, getting some of the words wrong while fondly chasing the tune. She follows him as he is carried away with the emotion. At the end, he sadly pronounces it “a song of lost love”, and thanks her. I can’t get this scene out of my head, a litmus test for the accuracy of Mr Turner, and one of the high-points in a film that’s possibly the most authentic representation of 19th century cultural life I’ve ever seen captured in cinema. Coincidentally the qualities of light captured on the screen are unlike anything I’ve ever seen in a film, but reminiscent of the light passing through the clean air in the few places I’ve been where the atmosphere isn’t befouled, such as St John’s Newfoundland or Reykjavik Iceland. The yellow light there is qualitatively different and we see it in this film, which seems to be at pains to help us see as Turner saw, or indeed, as humans saw almost two hundred years ago. You might know Leigh for his 1999 film Topsy-Turvy, exploring the lives of Gilbert & Sullivan, a film that also employed Spall, albeit in a smaller role. This time Leigh leans heavily upon Spall, who is onscreen for most of the 144 minutes. We picked up the DVD in the AGO’s store after seeing Painting Set Free, the exhibit of Turner paintings that recently opened here in Toronto. I would strongly recommend seeing the film if you don’t know the painter or his art. While I thought I knew the painter, I had no idea of the man and his extraordinary life. the evils of slavery come up in conversation, as Turner absorbs the conversation and in due course paints that horrific painting of the slave-ship with a tempest approaching, as they throw the sick overboard. Surely that’s not how it happened –that these images existed in an objective way, especially as shown in the first and third of the examples, and were merely reproduced by an artist who saw them directly before him—but rather it was Turner’s art that created these compositions, in his mind and in the play of materials on the canvas. But I won’t accuse Leigh of being reductive as this is perhaps a bit of whimsy from the film-maker, and delicious to watch. As with Topsy-turvy, the film takes its time and has no apparent interest in being commercial or cutting corners, which only enhances the sense of truthfulness. We see a painter, we see him painting, and we see him dealing with a public often unable to understand his work, without a clue as to what he was aiming for. But he’s not an ideological rebel or a deliberate revolutionary. I will continue to watch this film, enjoying the way that it offers a new window on JMW Turner. This entry was posted in Art, Architecture & Design, Cinema, video & DVDs, Opera, Reviews and tagged AGO, Dido's Lament, JMW Turner, Mike Leigh, Purcell, Timothy Spall. Bookmark the permalink.